One of the biggest impediments to the development of microscopes of good resolving power, was the characteristic that ordinary single lenses suffer from a number of imperfections which lead to distortion of the images. 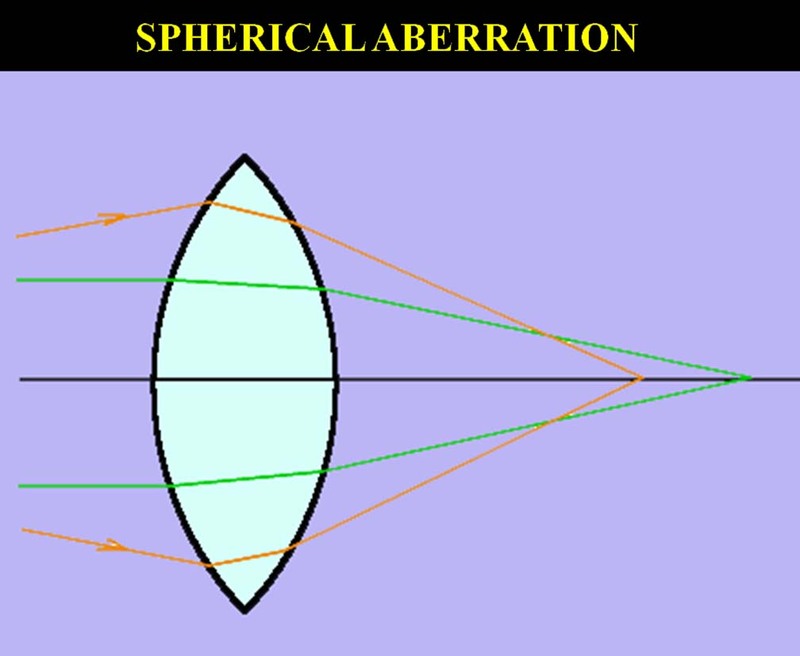 For microscopes, the two most important are known as Spherical Aberration (SA) and Chromatic Aberration (CA). 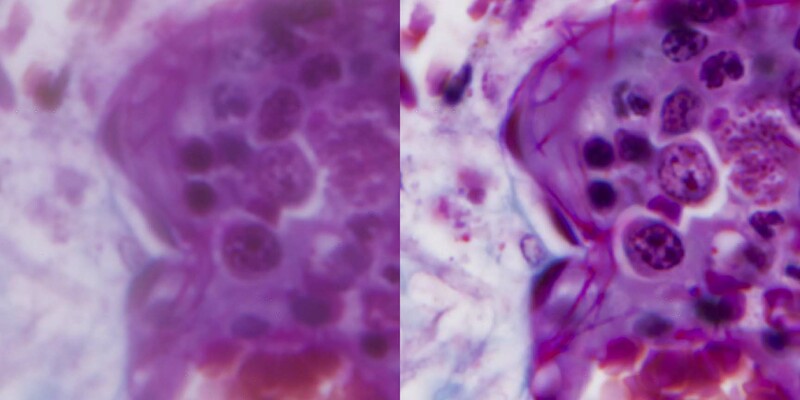 Although other aberrations also exist, these are two of the most critical, particularly for microscopes. The figure to the left illustrates diagramatically how chromatic aberration occurs. Light rays of different colors are each refracted to a different degree. 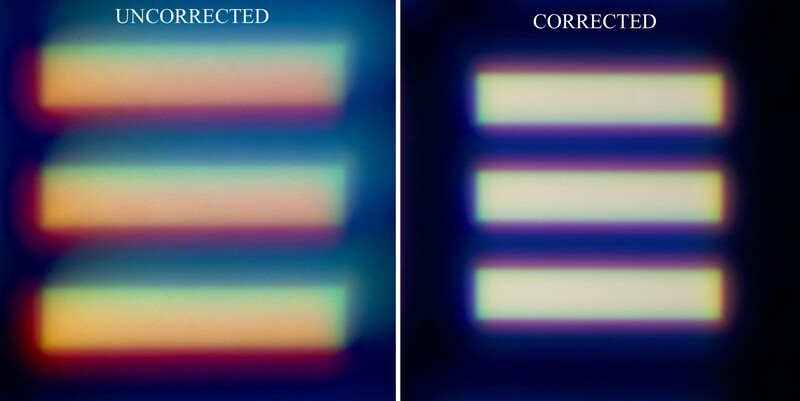 The improvement in resolution with achromatic optics is illustrated in the images to the right, courtesy of Dr Brian Matsumoto, and used by permission. Note the marked improvement in the clarity of the edges of the bars with the reduction of chromatic aberration. The illustration shown here to the left illustrates how spherical aberration occurs. Light rays which travel through the thicker parts of the lens are refracted to a different degree than those which travel through the thinner part of the lens, the notable exception being rays passing throught the central axis of the lens in a straight line. The pictures to the right, again courtesy of Dr Brian Matsumoto, illustrate the effect of lack of correction of spherical aberration and the improvement in the clarity of the image with its correction. 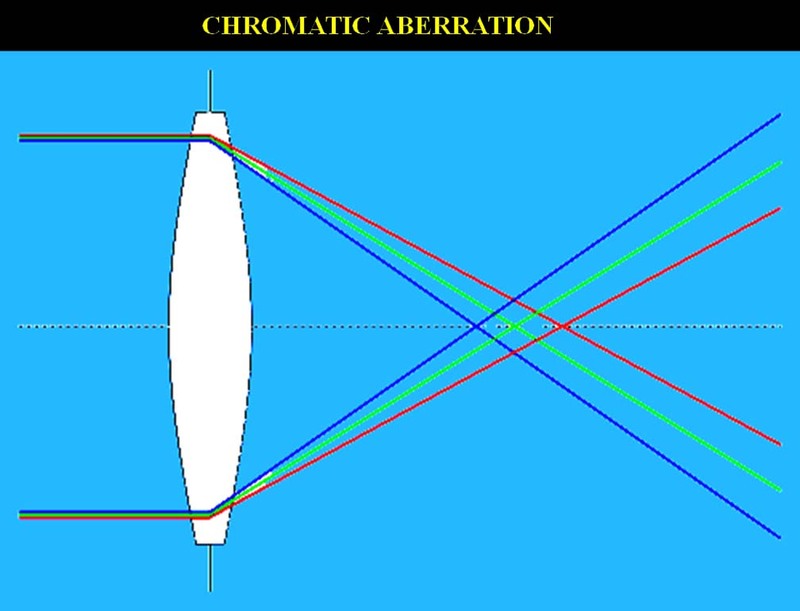 Correcting chromatic aberration was first accomplished for the telescope by Chester Moore Hall in the middle of the eighteenth century. Unfortunately, Hall did not patent his invention and the optician John Dollond, after learning of the design, did patent it. Making the tiny microscope lenses achromatic(free of chromatic aberration.) and aplanatic (free of spherical aberration.) was an entirely different problem and was not accomplished easily until Joseph Jackson Lister derived a mathematical formula, using combinations of Flint glass and Crown glass for this purpose, which for the first time allowed designing these lenses rather than trying to make them by trial and error. In Europe, a few opticians were able to produce relatively achromatic objectives in the first years of the nineteenth century. These included Marzoli in Italy and Harmanus van Diejl in Holland. In England, the first successful achromatic microscope objectives were produced at the request of C.R. Goring by Charles Tulley's son William Tulley in 1824. Also around that time, Chevalier made microscope objectives using four doublets for Selligue which, although suffering from spherical aberration, and required stopping down, were relatively achromatic. Goring went on to make suggestions which were pivotal in improving microscope objectives. J.J. Lister, father of the famous surgeon, learned lens making on his own, and by 1829 was making high quality achromatic and aplanatic objectives. In the 1820's Lister had discovered the principle of 'Aplanatic Foci' which states, that with a combination of two achromatic groups of lenses, there is a specific distance of spacing between them which results in an Aplanatic image. As Andrew Ross began making achromatic aplanatic objectives in the 1830's, he noted that he was unable to achieve reduction in SA as much as he had hoped, particularly in higher power objectives. Lister discovered that this was due to the variation in thickness of the cover glasses and that a change in the distance of the optical elements inside the objective could be used to correct this. Ross subsequently devised an easy way to make this adjustment variable, by inventing the correction collar. In 1839 Lister, who had associated with Ross, was allowed to teach James Smith how to make achromatic objectives, but Smith was initially limited to a minimum focal length of 1/4 inch. Smith's early objectives used inter-changeable elements, the front element being removed or added at will to change magnification; such objectives are part of Dr Hodgkin's Smith microscope of 1840, and also part of many of J.B. Dancer's outfits, including the Dancer microscope objectives in this collection. Lister continued to consider the problems in making corrected objectives for microscopes, and continued to work with Ross and Smith. As noted above, Lister had discovered the principle of 'Aplanatic Foci' in the 1820's. He shared this information with the major microscope-makers of the time, especially Andrew Ross and James Smith. This then, the principal of using achromatic lens combinations spaced at their aplanatic foci, was the key to the construction of modern corrected microscope objectives, which are both aplanatic and achromatic. These achievements are mainly due to C.R. Goring and J.J. Lister. Later on, it was found that further improvement in the image can be achieved by using achromatic and aplanatic condensers. The combination of achromatic-aplanatic condensers and objectives resulted in the form of compound microscope most commonly used today.